Two Everest base camps on the opposite sides of the base of the Mount Everest allow Everest climbers to acclimatize themselves to the high altitude environments. Mountain climbers all over the world rely on base camps for shelter. Base camps are particularly common on popular and hard to climb mountains. These shelters are situated so that climbers may rest after a day’s climb. If the summit cannot be reached from base camp in one day, the mountain will have several base camps. Everest Base Camp refers to two base camps, North and South, located on either side of Mt. Everest. The North Base Camp is located on the Tibet side and is used by climbers taking the northeast ridge route to the summit. The South Base Camp is located on the Nepal side of the mountain and is used by mountain climbers taking the southeast ridge path to the top. These shelters provide a much needed respite from the difficult ascent and are located at an altitude that allows climbers to acclimate to the extreme elevation. Individuals typically stay for multiple days. During the summer, motor vehicles are able to reach the North Base Camp and bring supplies for the year. However, the South Base Camp is inaccessible by vehicles and requires porters, sherpas, or pack animals. Thousands of adventurous climbers visit the Nepal side of Mt. Everest every year. In fact, this south side route is one of the most popular treks in the Himalayan mountains with an average of 40,000 hikers annually. The trail to the base camp begins in the town of Lukla and climbers have the option of hiking or taking a plane to Lukla from Kathmandu. On average, it takes 6 days of hiking to reach the South Base Camp. The most common stops along the way to this base camp include: Namche Bazaar (11,290 feet above sea level) and Dingboche (13,980 feet). This trek passes Dudh Kosi river valley, Mt. Pumori, and the Gorakshep sand-covered, frozen lake bed. The South Base Camp is located at 17,598 feet above sea level. Two powerful earthquakes in 2015 left the trail to this camp significantly damaged. The North Base Camp is located on the Tibet side of Mt. Everest at 16,900 feet above sea level. 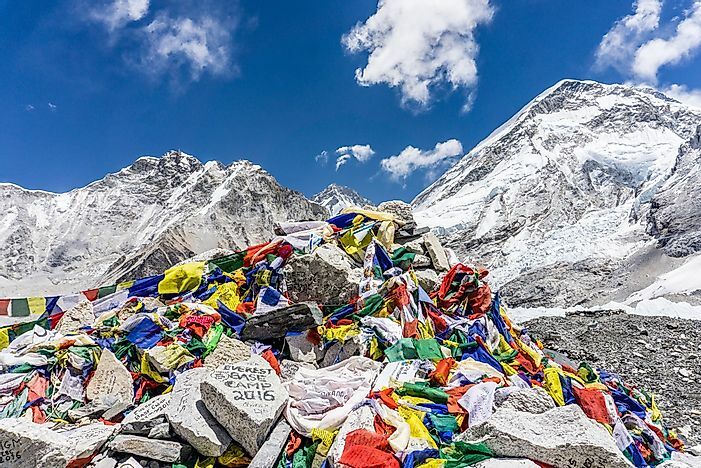 To visit this camp, mountain climbers must first receive two permits: one to visit Tibet and the other to visit the North Base Camp (issued by the government of China). These permits can only be obtained as part of a tour package with transportation, a driver, and tour guide. Transportation carries visiting mountain climbers to the town of Shelkar along the Friendship Highway. The North Base Camp refers to two sites. The first of these sites is popular with tourists and located near the Rongbuk Monastery at the foot of the north side of Mt. Everest. The actual base camp used by climbers is located further up at the edge of the East Rongbuk Glacier. After acclimatizing at this camp, trekkers head to the summit along the North Col, a sharp ridge that leads to a series of camps. Camp VI is the final base, located at 27,001 feet in elevation, where climbers rest before making the final effort to reach the summit.